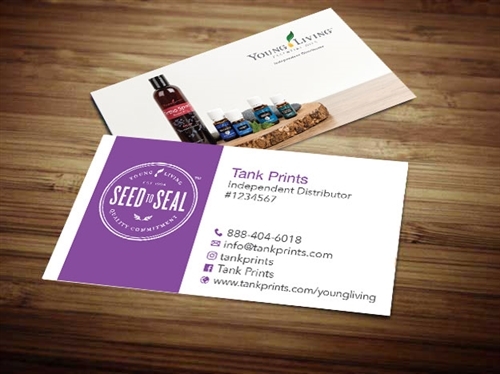 13 Amazing Young Living Business Cards - FREE SHIPPING! Read over 3700+ positive reviews about our business cards and our company! It's well-known that Young Living offers pure essential oils that have many useful applications. From aromatherapy and skin care to dietary supplements, these oils can help us all in our daily lives. You love this trusted brand's products and want to share the benefits with others. 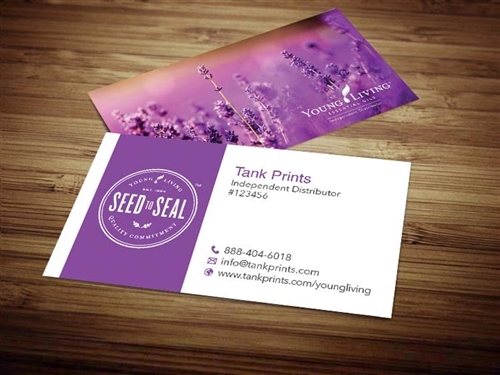 If you are just starting your wellness business or looking to jump-start your marketing efforts, Young Living business cards can help you now. You know where you are, but do you know where you want to be? Your new business cards can help you get there. Be Ready - You never know where your next opportunity will come from. At the grocery store or out with friends, with your new business cards, you will always be ready. Never miss that connection again. Be Professional - A well-designed business card template speaks for itself and, more importantly, your business. Make a polished first impression every time you meet a potential client. Show them you take their wellness seriously. Make sure you are equipped with business cards for Young Living today! Be Personal - Choose the business card design that best matches your individual style. Stand out from the crowd and select the card that shows your unique personality. Remember, your business represents you too!! Be Credible - Even if you are just starting out, our Young Living business card designs give you instant recognition and credibility. The colors, logo design, and product images featured on your card show that your business is a part of this trusted wellness brand. If you are ready to take the first step in getting to where you want to be, select your favorite Young Living template, customize your order, and purchase today! 1. Choose your favorite Young Living design. 3. Checkout and receive your cards in 5 business days or less! 4. 100% money back satisfaction guarantee! Welcome to the Young Living Business Tools Site!